PhoneSat 2.5 harnesses the power of commercially available smartphones to control satellites and direct their communication. The future of satellite technology may be in your pocket or purse. NASA has developed a line of tiny spacecraft based on commercial smartphones, in an attempt to demonstrate how well cheap, off-the-shelf electronics can perform and survive in the space environment. The latest mission, called PhoneSat 2.5, will hitch a ride to orbit on SpaceX's third contracted cargo mission to the International Space Station for NASA. The flight was supposed to occur on March 30, but a problem with some of the Air Force's tracking radar delayed the liftoff; a new launch date has not yet been set. PhoneStat 2.5 is the fifth in a series of smartphone-based spacecraft that have been launched into low-Earth orbit. Orbiting as high as 220 miles (350 kilometers) above the planet, the satellite will have its altitude controlled by a commercially-available smartphone. But don't hope to make a call if you wind up stranded in space. "If I showed PhoneSat to you, you'd ask, 'Where's the phone?" Bruce Yost, program manager for NASA's Small Spacecraft Technology program, said in a statement. "That's because, although we buy the smartphone off the shelf, much like the one in your pocket or purse, we take it apart and repackage it to fit in the cubesat form and work in space." The large memory, fast processors, high-resolution cameras, GPS receivers, gyroscopes and magnetometer sensors common in smartphones make them excellent tools to use in space, advocates say. PhoneSat 2.5 also carries a low-cost commercial altitude and determination system to rotate the satellite. While checking the feasibility of the control system and the capability of a smartphone to support space-based communication, the mission will also gather information about the lifetime of cellphone components in space. The satellite also includes higher-gain two-way S-band radio communications capability, allowing engineers to test the radio's capability to send commands to the spacecraft and back to stations on the ground. Controllers on the ground will attempt to receive photographs from the smartphone's camera, gathering information about future low-cost onboard imaging systems and star trackers. "We expect PhoneSat 2.5's orbital lifetime to be as long as six weeks," said PhoneSat software lead Cedric Priscal, of NASA's Ames Research Center in Moffett Field, Calif.
"This operation time will help us demonstrate that the system can survive being exposed to the doses of space radiation all satellites must endure in low-Earth orbit, and help us to gather data on the effects radiation has on satellites," Priscal added. But don't look for a six-week smartphone battery any time soon. NASA equipped the PhoneSats with solar panels to keep them charged. Last November, PhoneSat 2.4 demonstrated that a smartphone can serve as an avionics controller. Using a magnetometer and a magnetorquer, the satellite aligned itself with Earth's magnetic field, a first for Ames' small satellites, which have previously relied on passive, permanent magnetic torque rods. As of March, PhoneSat 2.4 continued to transmit data, implying the continuing operation of its solar arrays, battery-charging circuit, data router, and Arduino watchdog. However, in January, the smartphone began to experience recurring resets that coincided with a period of high solar flare activity, NASA officials said. 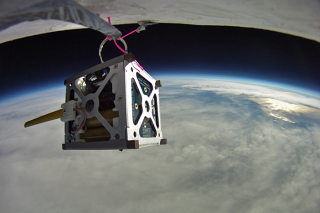 NASA's Cubesat Launch Initiative, which PhoneStat 2.5 is part of, provides opportunities for small satellite payloads to piggyback on previously planned launches. The cube-shaped satellite measures about 4 inches (10 centimeters) on each side. The PhoneSat missions serve as pathfinders for future NASA missions, including the Edison Demonstration of Smallsat Networks (EDSN) scheduled to launch later this year. With EDSN, NASA hopes to demonstrate the concept of multiple small satellites working together. The eight cubed satellites, based on the PhoneSat architecture, will fly in a loose formation. Each satellite will be able to cross-communicate with the others, allowing engineers to study space-to-space communications and the ability of small, inexpensive satellites to monitor space weather. But EDSN is only the beginning, NASA officials said. Engineers hope to utilize the fast-moving technology of commercial electronics to travel well beyond low-Earth orbit. "The next step is to add a propulsion system to pave the way for cubesats to explore further into the solar system," said Oriol Tintore, PhoneSat mechanical lead at Ames.